This watch has been sold to a lucky buyer. Contact us if you have one to sell or if you require Breitling Chronomat 769 vintage watch repair service. For many, the Breitling 769 Chronomat represents the epitome of vintage watch collecting. The Chronomat’s rotating slide rule function was truly a revelation in it’s day. Scientists, engineers and mathematicians had the ability to perform complex calculations decades before the invention of the hand held calculator. This watch was produced just after the end of World War II making it useful for many as they begun to rebuild what was lost. This Slide Rule Dial Can Perform Many Calculations and can be Used as a Tachometer, Speedometer, Telemeter, Pulsimeter, Metronome, Production Counter, and for Mathematical Calculations including Multiplication, Division and for Calculating percentages, Prices, Fuel Consumption, Interest and Rate of Exchange. It Can Even Be Used In Meteorology to Calculate Cloud Speed. But Can It Core A Apple? 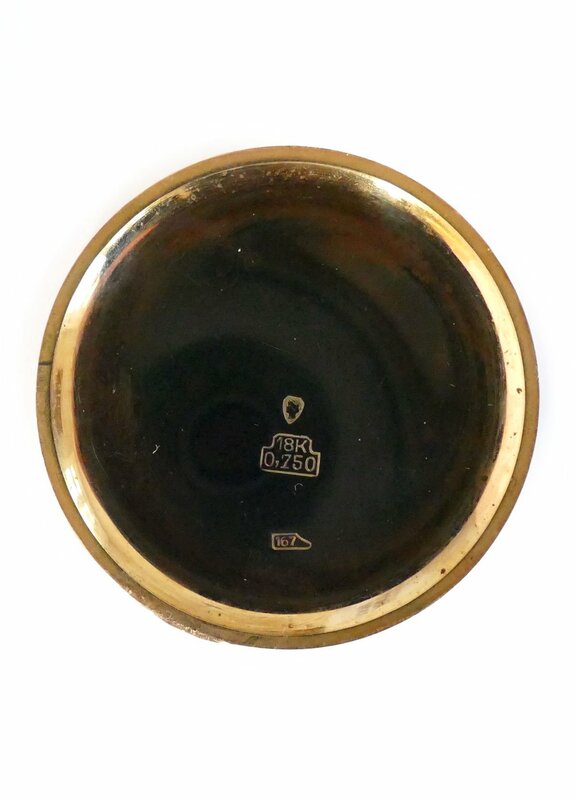 This Chronomat features an original dial, 18K Gold Case, and Venus 175 Breiting signed movement. 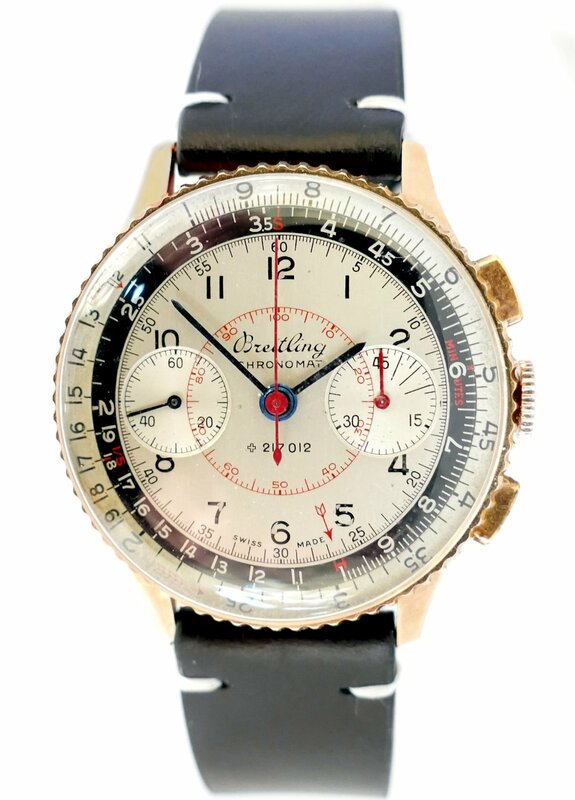 This watch is signed Breitling on the dial, case and movement. 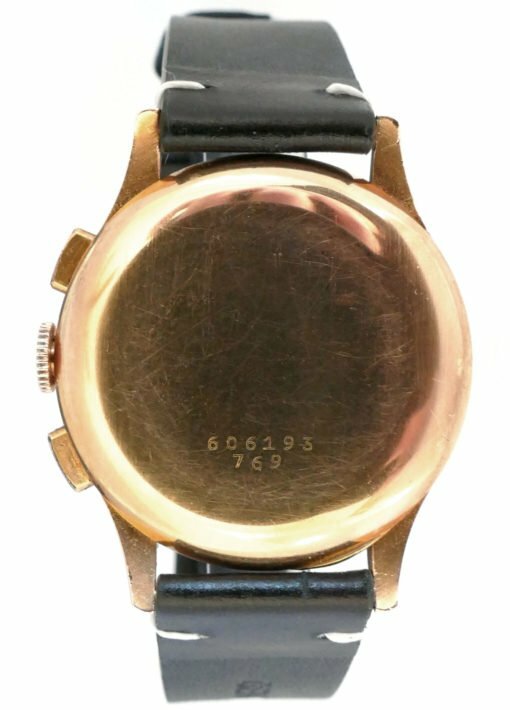 Unpolished Solid 18K Rose Gold Case with Slide Rule Bezel. Right Side Pushers Control the Chronograph. Top Pusher Starts and Stops the Chronograph and Bottom Pusher Resets Counters to Zero. Case is Signed with the Breitling Reference Number 769. The Serial Number Dates this Watch to 1945. Original Two Tone Dial with Painted Numbers and Matching Original Blued Steel Hands. The Red Center Chronograph Hand is Also Original. This Stunning Dial is Signed Breitling Chronomat, and Swiss Made. There is a Center Decimal Track in Red. On the Right, at the 3:00 Position, is the 45 Minute Recorder Register. On the Left, at the 9:00 Position, is the Constant Seconds Register. The Bezel Rotates and The Perimeter Scale Turns With the Bezel. This Slide Rule Dial Can Perform Many Calculations and can be Used as a Tachometer, Speedometer, Telemeter, Pulsimeter, Metronome, Production Counter, and for Mathematical Calculations. 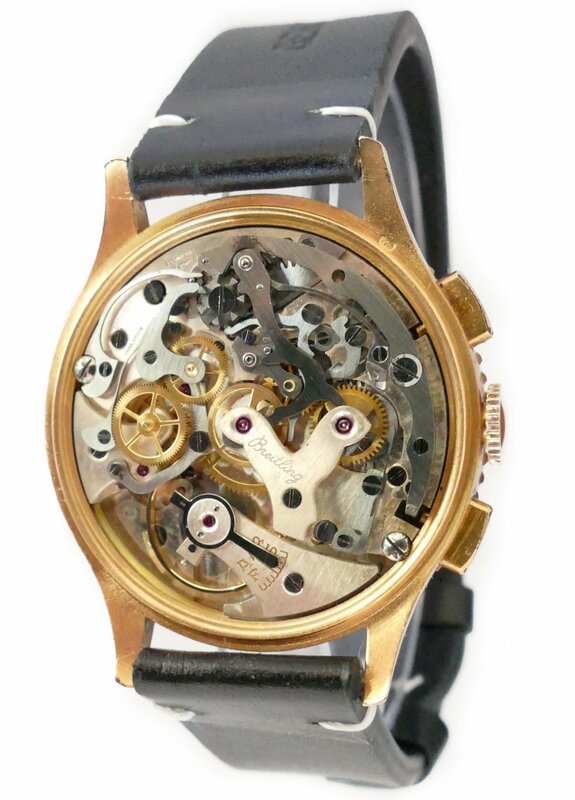 This Venus Caliber 175 Swiss Made Manual Wind Chronograph Movement has been serviced and is In Excellent Condition. Signed Breitling, Swiss.